I was the girl who could spend two hours organizing her notebook and desk space before studying for 30 minutes. I can't function in a chaotic environment. It overwhelms me. That being said, I end up with crazy messes in my house. I have psychoanalyzed myself (ha!) and I think that it's because once a mess gets to a certain point, I can't stand to deal with it...so I ignore it until it annoys me so much and I crack. It's basically a fact that I'm crazy-don't judge it-but because of this, each room in my house gets an insane deep clean every once in awhile. 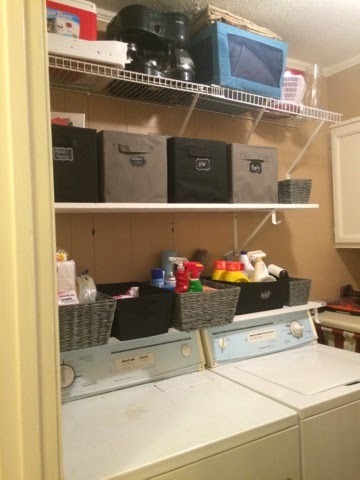 My laundry room is a small space that houses cleaning supplies, wrapping supplies, indoor tools, crafting things, sewing things, the dog food, our water heater, and you know, the washer and dryer. It is probably 8*10 and can get really cramped and chaotic. 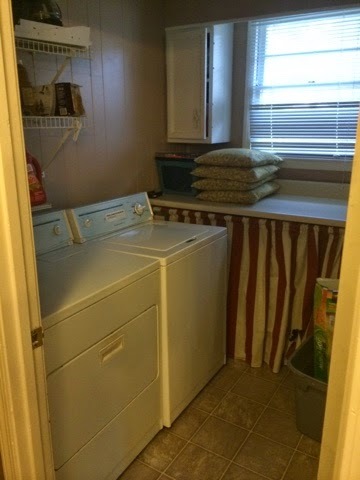 Additionally, the laundry room is "that" room. You guys know what I'm talking about--it's the room where we stick stuff when people are coming over and close the door! The top of my dryer had a random assortment of gloves, papers, and even a side-view mirror for my car (can't make this stuff up)! 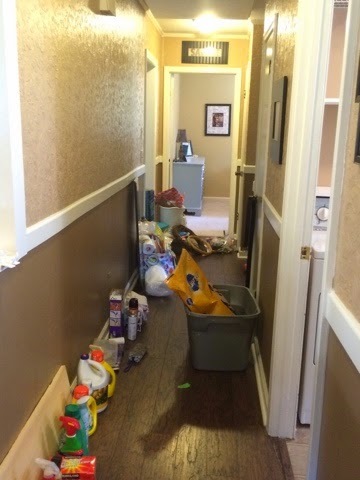 This is the cleaned space from back in October. I took pics of all the rooms in my house because it was super clean and I thought I may need them one day! Note the huge bag of dog food on the floor. 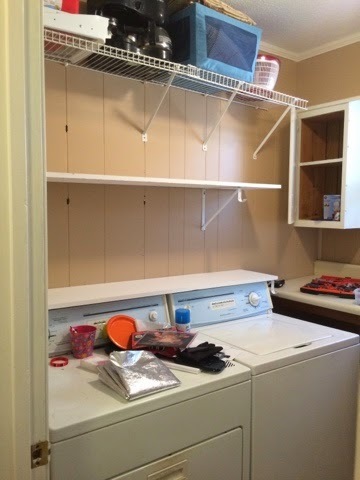 We had a half shelf above the dryer and two small shelves going up the wall. 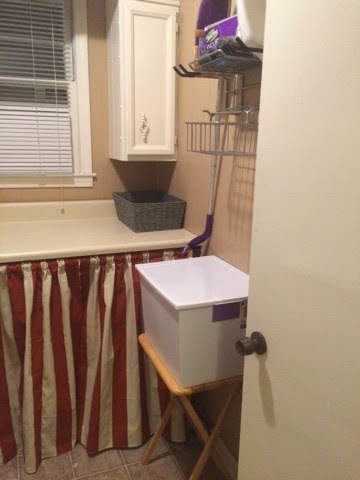 I had Pinterest envisions of long shelves above my washer and dryer holding cute bins and using the curtained space under my long countertop (which hides the water heater and lots of unused space) more effectively. First, I emptied the room. Oh man. It was a lot of junk! See the random piles of stuff going down my hallway? Ick! I bought some bins for the middle shelf that were tall and square. I wanted to be able to hide the stuff in them! I got four-one for party (the assortment of paper products that is left over, random decor, etc), one for paint/crafting, one for sewing (not including fabric-that's in the top blue bin), and one for ribbons and yarn. I labeled them with chalkboard labels. 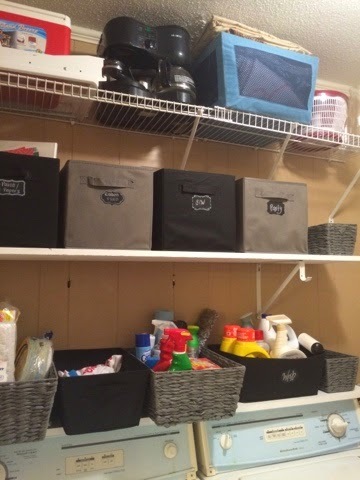 The bottom shelf was going to hold every day paper products (we use them for small group weekly), cleaning supplies, laundry stuff, and misc storage needs. I knew the items would be taller and I needed to get to them every day, so I bought short and wide baskets in the same colors as the bins. I had to turn the "laundry supplies" basket sideways so the washing machine lid would stay open for loading. Underneath the counter, I put a small Rubbermaid tub that holds gift boxes/bags, tissue paper, etc and a tall wrapping paper container. Also under there is room for my file cabinet when it comes time to move it from our current office. I bought a new dog food bin and put it on top of a small table so I can push the vacuum under the table to take up less floor space. I'm so pleased with the organized project! Everything is in its own designated place and I can't see any of the clutter. It's cute and functional. I count that as a win!! !